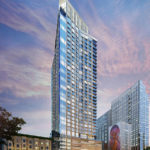 With 2018 having ended the year with Bay Area employment at an all-time high, the number of people living in San Francisco with a paycheck has since inched up 700 to a record 574,900 while the unemployment rate in the city, which ended the year at a record low of 2.1 percent, inched up to 2.4 percent as the labor force increased by 2,500 to 589,100. 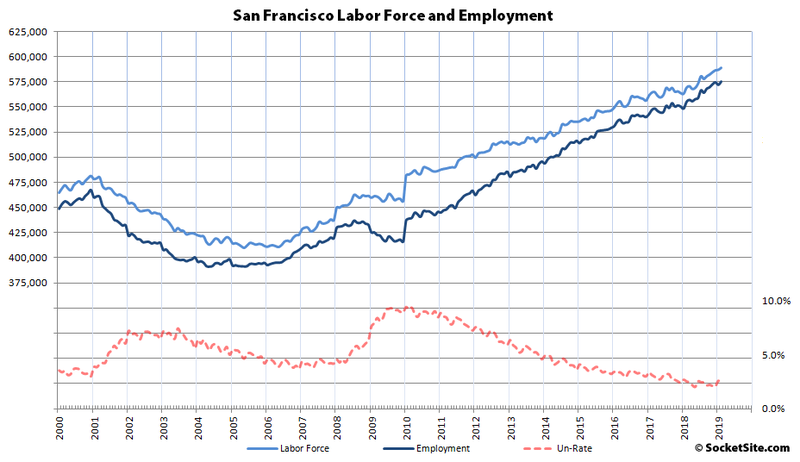 And as such, there are now 138,200 more people living in San Francisco with paychecks than there were at the start of 2010 and 20,200 more than at the same time last year, but the rate of change has slowed down over the past quarter. In Alameda County, which includes the City of Oakland, the estimated number of people living in the county with a paycheck has slipped by 1,500 over the past two months to 832,100 but remains 15,300 above its mark at the same time last year, and 139,300 more than at the start of 2010, with an unemployment rate of 3.1 percent. Across the greater East Bay, including Solano County, total employment now totals 1,585,800, which is 26,300 above its mark at the same time last year with an unemployment rate of 3.4 percent. Up in Marin, the number of employed residents has slipped by 600 over the past two months to 138,800 but remains 2,300 above its mark at the same time last year with an unemployment rate of 2.5 percent. 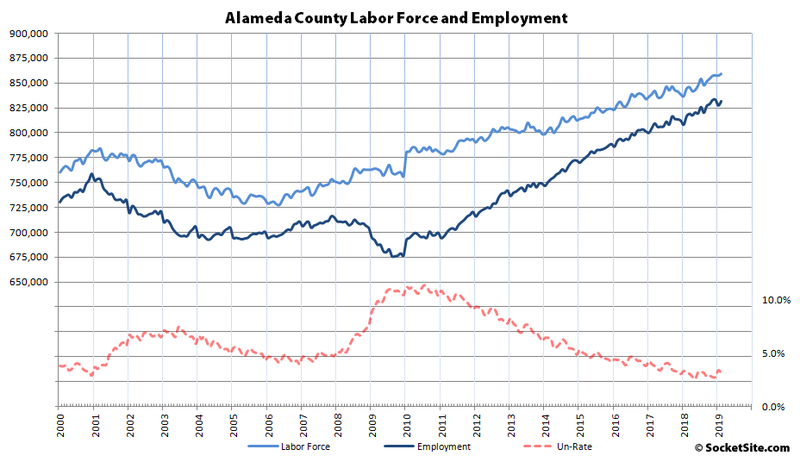 And down in the valley, employment in San Mateo County has inched up by 400 to a record 454,800, which is 15,500 above its mark at the same time last year, with an unemployment rate of 2.2 percent, while employment in Santa Clara County increased by 4,200 to a record 1,038,200, which is 26,300 more than at the same time last year, with an unemployment rate of 2.7 percent, resulting in a blended unemployment rate of 2.6 percent across Silicon Valley and 2.9 percent across the Bay Area as a whole with a record 4,118,100 people employed (which is 91,600 more than at the same time last year). That being said, keep in mind that Bay Area home sales actually declined last year. And in San Francisco, pending sales remain down on a year-over-year basis, despite an increase in inventory levels, but have started to pick up steam. No wonder the traffic is hellacious. I still maintain we have a TOO MANY PEOPLE crisis, not a housing crisis. Do you have a modest proposal about what to do with all the excess people? My comment was actually a literature joke, but maybe I should know better than to attempt humour here. The rent control privileged (and their enablers on the BOS) are shooting for the latter and the free market for the former. I think traffic has to got to be seriously adversely effected by the sheer amount of rideshare cars, and their constant double parking. I’ve got nothing to back that up other than it seems obvious. I’d love to see the city do a study on rideshare cars, and to cap the total, at some point. I’ve been in SF for 25 years. Traffic has without question become more congested. More people, more cars, more construction, more MUNI incompetence, and more city government “traffic flow control” (ie. more barriers to traffic flow) are all contributing factors. But why cap the number of rideshare cars? Uber and Lyft give the people a better option for getting around. A lot of SF adults have given up their cars because Uber/Lyft are easier to use (and also cheaper), even if it takes a little longer to get there (but I don’t have to be the one doing the driving, so I get to entertain myself on my phone!). Autonomous vehicles, when they finally arrive for wide scale use, will only hasten this trend. Better public transportation could obviously help everyone, but the track record of our city and state suggests that public transportation will only get worse over time. You sorta answered your own question. Folks may be giving up their own cars but if the mode shift is to uber or lyft rather than transit they are still using cars to get around, hence the number of cars on roadways continues to increase. We’re already at ~3 minute wait times for Uber or Lyft. What more is even necessary? One of the answers to the double parking issue is much more protected curb parking space. We’ve never had much of a tradition of taxi stands in this city, but Uber/Lyft have really changed the game and really require rideshare pull ins on every commercial block (or any arterial street where there is much traffic). That creates a conflict with parking for other cars, but it’s the only thing (combined with enforcement) that can solve the problem. You’ll STILL be stuck with a huge need to educated Uber/Lyft drivers who (as it has already been noted) are often out of towners and not proficient at lots of basic urban driving etiquette. In addition to doing stupid things like not pulling into intersections on the yellow to get the left turn (and allowing through traffic to get around them), they always insist on providing excellent service by stopping directly where their GPS tells them they are supposed to go rather than finding the closest legal space to pull out of the lane. That needs to stop. It’s not at all clear to me that San Francisco should change planning processes around the depredations of businesses like Uber and Lyft whose existence is dedicated to thwarting urban planning, mass transit and local government. If the Travis Kalanick types want to operate an illegal taxi businesses, why should The City facilitate them? And as curmudgeon almost admits, it won’t work even in theory, because the business model of those companies depends on a highly elastic, compliant and largely non-local labor supply. If you did “educate drivers on lots of basic urban driving etiquette”, as soon as those drivers became “educated”, they’d probably unionize because the average Uber driver makes less than the minimum wage. Uber isn’t a cure, it’s a cancerous growth that must be excised. All that being said, both when I am riding my bike and driving, I have noticed that the double parking by Uber/Lyft drivers seems to have gotten much, much worse over the last three years. The solution, contra “curmudgeon”, or “caps” is probably congestion pricing, which could be implemented as a tax on so-called “ride share” services” during peak hours, since we know they have the infrastructure to charge it. Uber and Lyft are basically quasi legal taxi services and if The City creates more protected curb pull ins on every commercial block, then The City should impose the requisite taxes on those services to fund it. I have never taken either service and don’t plan to. I should’t be subsidizing private businesses whose purpose is to undermine public transit. Barring that, if private vehicle miles traveled stays on it’s upward trajectory we should adopt New York City-style congestion pricing. Brahma, don’t disagree, particularly about congestion pricing.